New Kid on the Block…er, Rock! Nile Monitor. There couldn’t be any mistaking where this fellow comes from. The pattern, the color combination, the design – pure Africa! Doesn’t his skin look like fancy bead-work? 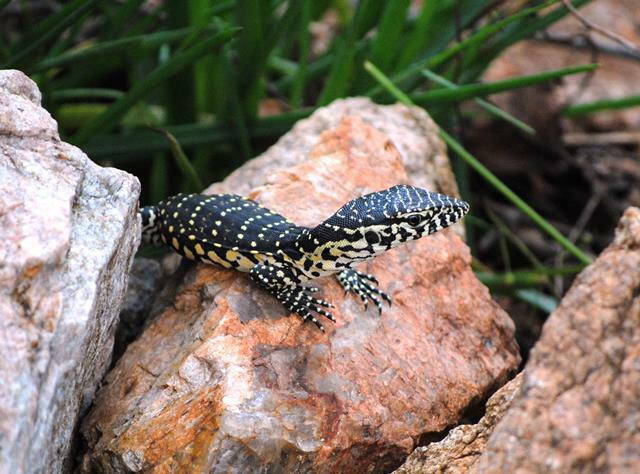 Africa’s got its share of fancy lizards, just look at the astonishing agamid. But there are a fair number of other spectacularly decorated reptiles. 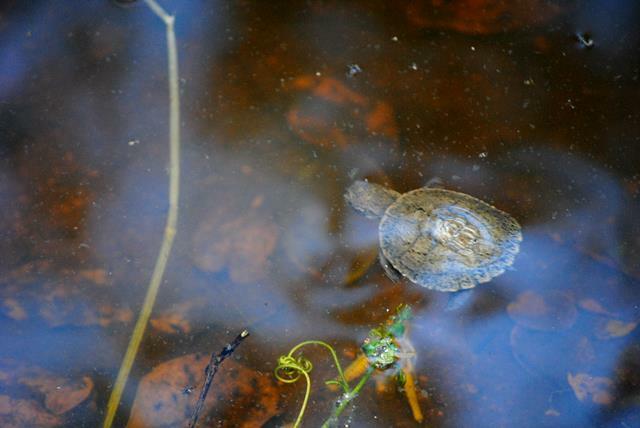 This spunky little guy is facing up to the big world. Only a few weeks old, he’s the king of his little waterhole. He wasn’t at all afraid of us – just carried on hunting juicy insects – ignoring the persistent click, click, click going on behind him. He’s not fussed about being a decorated reptile. There’s more important things to think about…like food. 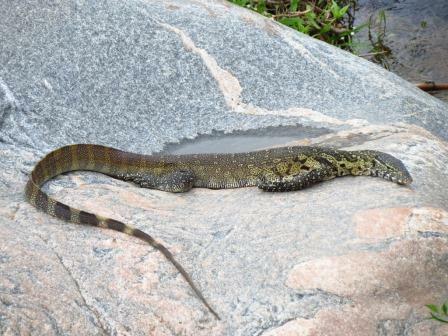 From this size (About 18 inches/46 cm) this baby Nile water monitor (Varanus niloticus) will grow to at least five feet (153 cm). Along the way he’ll lose the “cute” and get lean and scaly like this grown up living in the Kruger Park that we photographed at the Sabi River. Come to think of it, he doesn’t look very different from our baby and you can’t see the size, but this guy’s about fully grown at around 2 meters (6’7″) – a whole lot bigger! There’s another African Monitor that lives here but it doesn’t much like the water. 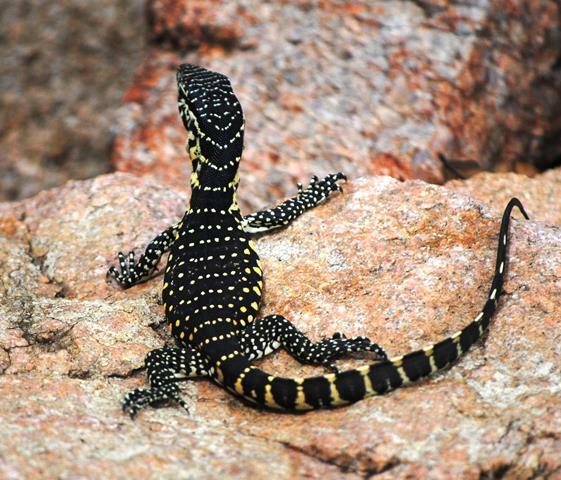 The African Rock monitor is also a decorated reptile painted in russets, browns and terracotta. 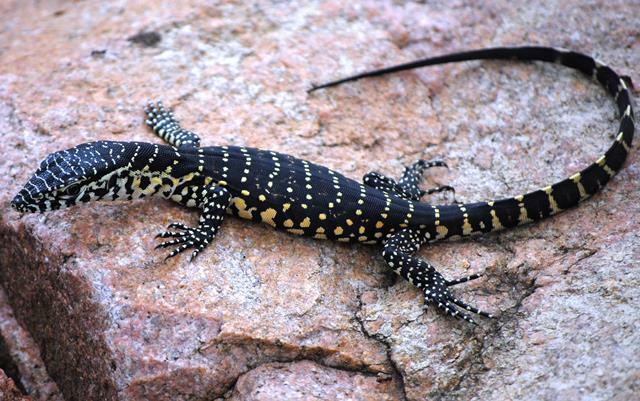 Also good looking…if you like lizards!